Accommodating just 28 people, Orpheus is an all-inclusive, private island lodge located in the Great Barrier Reef. With only 14 rooms, suites and villas, Orpheus Island is the ultimate in secluded, unspoilt tropical paradise, and stretches across 11km of immaculate turquoise coastline. The island itself, comprising more than 1,000 hectares of national park, is surrounded by pristine fringing reef you can access simply by stepping out from your accommodation. The island lodge features the main pavilion bar and alfresco-style dining area, a restaurant, a reading room, Gwandalan Day Spa and an inviting 25m x 13m infinity pool that mirrors the Coral Sea. All stays at Orpheus include three gourmet meals prepared daily by chef Paul Wilson and his team, use of water sports equipment, unlimited Australian beer and wine as well as soft beverages, and a daily Orpheus experience. This idyllic island provides unrivalled access to the untouched Great Barrier Reef. Its principal dive sites boast 1,100 of the 1,500 species of fish on the reef; the local waters are a fisherman’s playground and home to the most sought after reef fish species in the world. 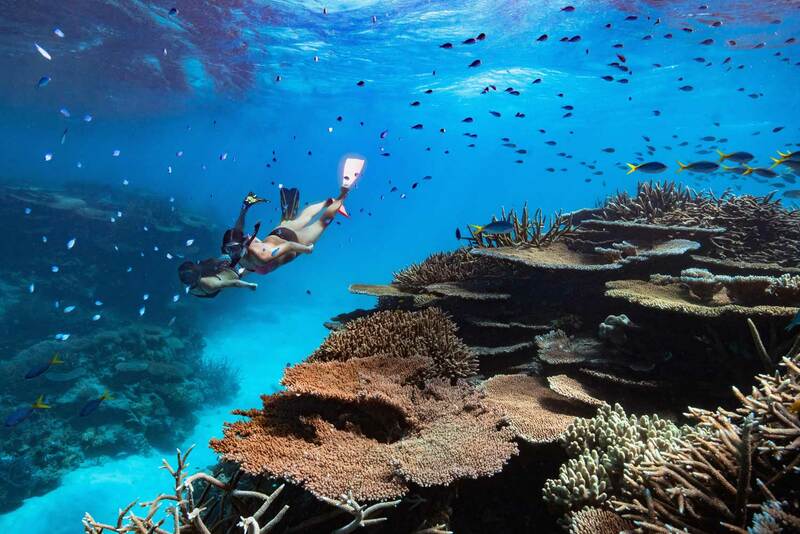 Explore the magic of the Great Barrier Reef with a personalised snorkelling or diving tour and come face to face with an enchanting underwater world that will take your breath away. Orpheus has a warm tropical climate with an average temperature of 27°C (80°F) year-round. The water temperature varies between 21°C (69°F) in the winter and 29°C (84°F) in the summer. Remember that during the wet season (November to April) there is a chance of rain during these times. Orpheus closes each year during February. During the cooler, drier months from May to October, when the south easterly winds blow, the weather is pleasantly warm with reduced humidity and plenty of sunshine. The Great Barrier Reef hosts one third of the world’s coral species and is home to an abundance of marine life. Whilst the reef area surrounding Orpheus Island is still in excellent condition, there are many areas on the reef that have been impacted by coral bleaching, damage from cyclones and the coral-eating starfish, The Crown of Thorns. Orpheus Island Lodge is respectful, protective and proud of the reef and is investing in the preservation of this exquisite organism for future generations. We are working in partnership and providing funding support to James Cook University to address the Crown of Thorns issue, the Orpheus Island Research Station on the recovery of the reef after cyclones and with Great Barrier Reef Legacy to understand coral bleaching and ways we can assist the reef to adapt. We also foster visitor connections with the world’s largest living organism in line with Great Barrier Reef Marine Park Authority regulations so you can feel confident your experience is a positive one for you and mother nature. Wild about wildlife? There is breathtaking nature to enjoy all-year-round at Orpheus Island. Orpheus Island Lodge is respectful, protective and proud of the reef and is investing in the preservation of this exquisite organism. Awaken the senses and rebalance the mind and body at Gwandalan day spa. There are a number of beaches to explore around Orpheus Island, and an inviting 25m x 13m infinity pool that mirrors the Coral Sea adjacent to the main Pavilion. The social meeting point at Orpheus. Guests can enjoy complimentary wines, beers, soft drinks, juices and snacks, as well as order that special cocktail, boutique beer or French champagne. We offer a selection of publications for guests to enjoy that can be handpicked at our boutique. Shop from a range of boutique Australian brands. The boutique offers sunglasses, swimwear, shirts, cover-ups, hats and holiday memorabilia. Get all the essentials for your diving adventure including sunglasses, rashies, iphone cases and, of course, diving gear. A little spot to take a break from the sun, play pool, some games or watch TV. 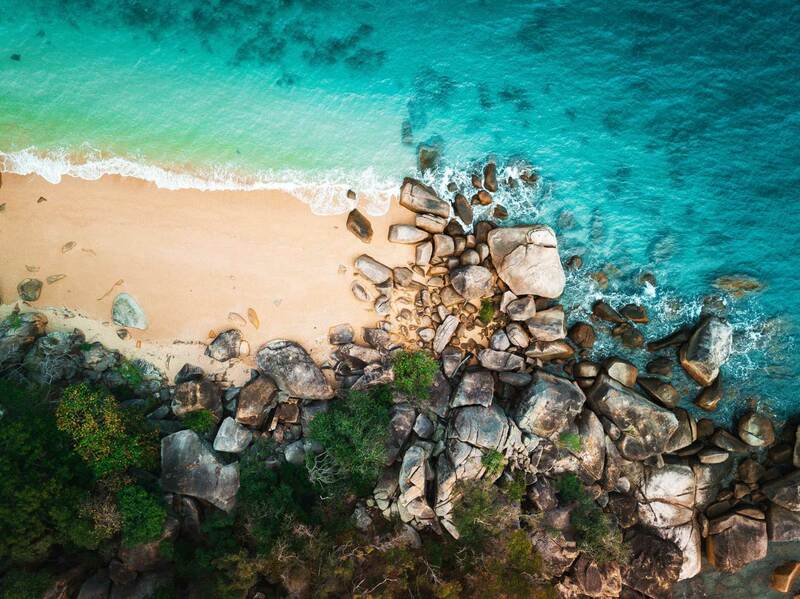 We offer extensive complimentary and paid adventures including diving, snorkelling, fishing, beach/island drop offs, sunset cruises, guided walks, access to Hinchinbrook Island where you can explore the waterfall, and James Cook University research station tours. Our catamaran can be used by guests as they wish. We offer paddleboards, kayaks and dinghies for complimentary guest use. There are a number of walking tracks that allow you explore the beautiful native bushland of Orpheus Island’s National Park environment. Orpheus Island offers WIFI in the main pavilions and is covered by the Telstra mobile network. Other networks provide limited coverage.